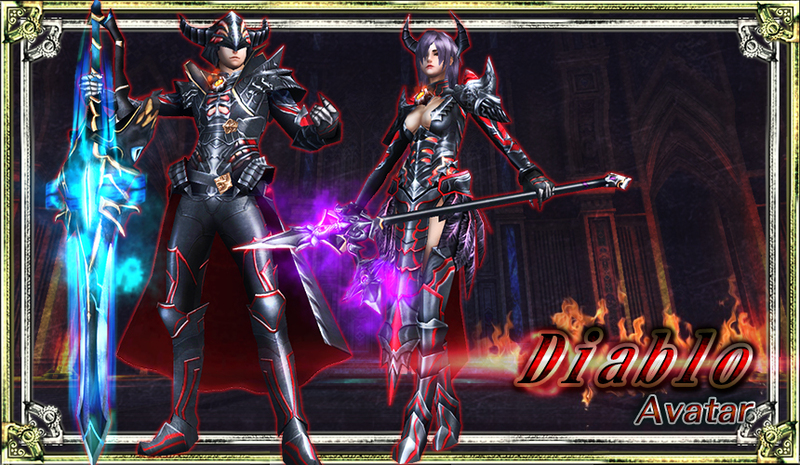 "--- "Premium Diablo Pack" with double valuable campaigns are out now! when total Spun time(s) of "Premium Diablo Pack" reaches the required Spin time(s)!! -- A "Shining Avatar" of the Diablo Avatar will be gifted! -- An "Upper Avatar" of the Diablo Avatar will be gifted! --- Try out! "[3 Gems one time only] Premium Diablo Pack" add +1 purchase limit Spin campaign! [1 Gems one time only] Premium Diablo Pack. Players who didn't purchase in the past will be able to buy up to a max of twice Spins! Get the Diablo Avatar at this chance!! *1 type of color item "A", "B", "-DC" or "No mark" will be randomly gifted from the above items types. The "Avatar Jackpot Pack" will be back on sale. Set with one of a FULL SET of the avatars above. A 1 color set of avatar costumes (Head A, Head B, 1 Upper, 1 Lower) of the avatars above. A 1 color set of avatar weapons (includes Shields and Accessories) of the avatars above. Or 4 color set of a portion of avatar costumes (Head A, Head B, 1 Upper, 1 Lower avatar). * Some SP+ Bonus Sets will not include weapons. *Not just the above, single item avatars and non-avatars maybe won. * The won items "1 avatar from each part of the target avatar" will be won as "Avatar BOX"es. 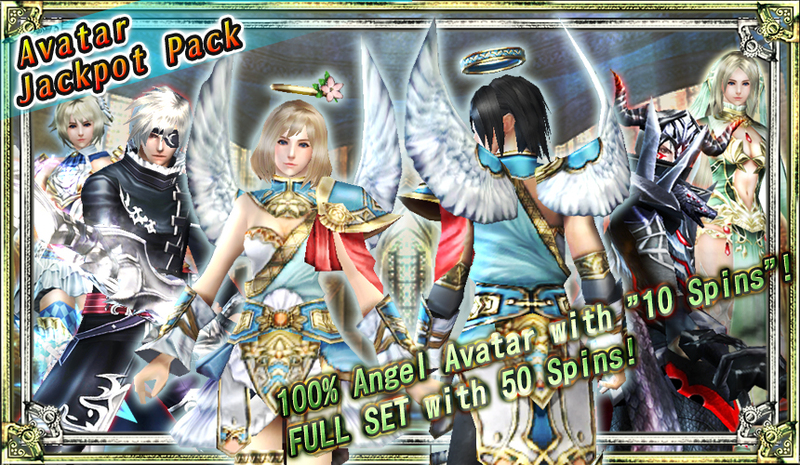 * The newly added "Angel Avatar" includes only avatar items. --- Evo liquid 5 or above! "[5+] Enhancement Pack" now on sale! Won items will be changed from the "Enhancement Pack" and will be on sale as a bonus Pack! with a more higher chance to win the "Evo liquid 5"! Don't miss this chance if you were seeking the "Evo liquid 5"! --- Rift Stone 50 or above! "[50+] Mystic Stone Pack" now on sale! Won items will be changed from the "Mystic Stone Pack" and will be on sale as a bonus Pack! with a more higher chance to win the " Rift Stone 50 "! Don't miss this chance if you were seeking the " Rift Stone 50 "! - " [50+] Mystic Stone Pack"
--- Slot Release 50 or above! "[50+] Shining Orbs Pack" now on sale! Won items will be changed from the "Shining Orbs Pack" and will be on sale as a bonus Pack! with a more higher chance to win the " Slot Release 50 "! Don't miss this chance if you were seeking the " Slot Release 50 "! - " [50+] Shining Orbs Pack"
Hi Guys! Don't forget to follow us on twitter "@AVABEL_EN" ! !